Hi everyone, I have just gotten off-the-wall the phone with DOC about the Molesworth Station Rd. It is currently still open. At this stage they will be closing it on Monday the 11th so it should not affect us. They have asked that I ensure everyone is aware how hot and dangerous it is. Take plenty of water. This status could change at any time. I will stay in touch with DOC. they also told me that any status change will be put up on the website immediately. You guys are all amazing, keep chipping away. Notown Road is closed for logging. Do not enter. I haven't had too many emails so I assume you are all set, that the cues make sense and that the .gpx files have uploaded ok.
Hi 2019 Brevet/Brevette riders! Just to let you know you are welcome to leave any gear at Bikefit Marlborough on Market Street. Opening hours; Mon to Fri 8am to 6pm, Sat 9am to 2pm and Sun 10am to 2pm. Good Luck everyone! Please support them if you need any last minute bits n bobs. The ride briefing will take place at 8am at Seymore Square, the start is at 10am from the same place. There's not too much to tell you at the briefing but I want to allow plenty of time for last minute questions and SPOT collections. This also allows you to listen to my dulcet tones then attend to the last minute nervous poos etc. You might even have time for a coffee and muffin. The weather is looking a little cooler in Blenheim on Saturday and also in Nelson on Sunday. At this stage there are no further forest closures that I am aware of but of course I will be monitoring this closely. Hi, I have been in contact with The Nelson City Council and DOC about the current situation. I will call the Rainbow station Manager this evening. As it stands today the Maungatapu Track is open for bikes, but the forest which the Brevette travels trough from the top of Whangamoa Saddle is not. The Maitai Valley tracks are closed to recreational users. Rabbit Island is closed to recreational users. Brevet riders, the only change will be in the Maitai Valley, you will continue all the way down Maitai Valley Rd without crossing over the Tantragee Saddle. Brevette Riders will not turn left off SH 6 but will continue on to join the cycle trail at Clifton Terrace School which will tack you into Nelson. You will not go across to Rabbit Island on the Great Taste Trail turning left onto Redwood Road then right onto The Coastal Highway, then right onto Mapua Road. Hopefully the Rainbow and Molesworth remain open for the next couple of weeks! I plan to update the .gpx files and cue sheets tonight/tomorrow and email out as soon as I can. I realise this is not ideal but none of these changes should affect you overall planning of food/water or accomodation. I thought it was going along too well! Just a heads up kids we may have to make a couple of slight changes to the courses unfortunately. I need to do some further investigation into this and how it affects our route. Please bare with me while I work through this. I have just emailed out both the Brevet and Brevette .gpx file, cue sheets and a link to the ridewithgps page for the routes. I do not guarantee 100% accuracy of the cues, I’m human ;-) They are done to the best of my ability and the ability of technology! You will need to download ALL .gpx files for the entire course. Please if you find any issues let me know ASAP. 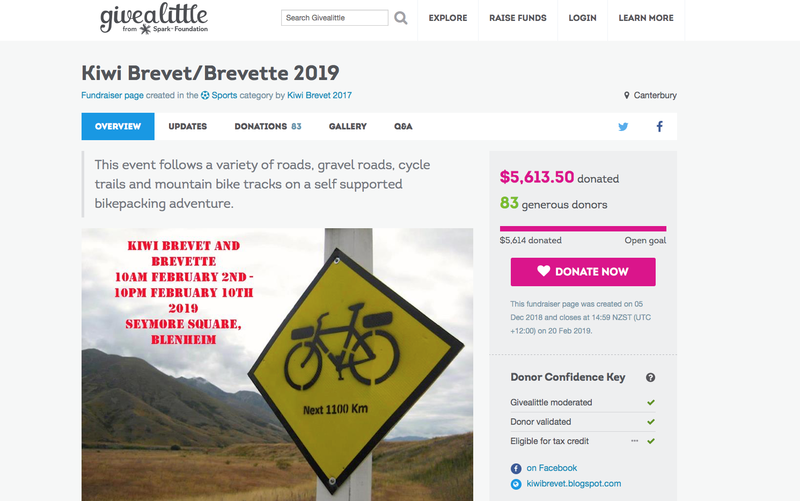 An 1100 and 750 km bicycle brevet around the top of the South Island - with as much off road riding as possible. Event creator Simon Kennett rode the 4000 km Great Divide in 2008 and decided to replicate the experience in New Zealand. This is the original kiwi brevet that spawned several other brevet throughout the country. 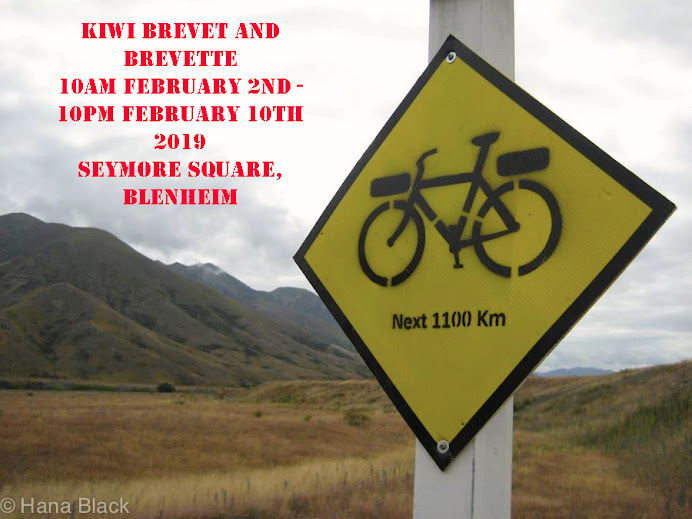 The 6th Kiwi Brevet and Brevette are to be take place from February 2nd through 10th 2019.